The papal interests represented by the Templars brought on a conflict with Egypt in 1243, and in the following year a Khwarezmian force summoned by the latter stormed Jerusalem. The crusaders were drawn into battle at La Forbie in Gaza. 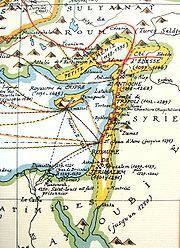 The crusader army and its Bedouin mercenaries were completely defeated within forty-eight hours by Baibars' force of Khwarezmian tribesmen. This battle is considered by many historians to have been the death knell to the Kingdom of Outremer. 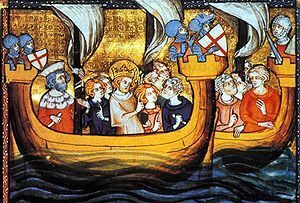 Although this provoked no widespread outrage in Europe as the fall of Jerusalem in 1187 had done, Louis IX of France organized a crusade against Egypt from 1248 to 1254, leaving from the newly constructed port of Aigues-Mortes in southern France. It was a failure, and Louis spent much of the crusade living at the court of the crusader kingdom in Acre. In the midst of this crusade was the first Shepherds' Crusade in 1251. The Shepherds' Crusade refers to separate events from the 13th and 14th century. The first took place in 1251 during the Seventh Crusade; the second occurred in 1320. In 1248, Louis IX of France went on the Seventh Crusade, but after the defeat of the crusaders, he was captured at Cairo in Egypt. A peasant movement arose in northern France to support Louis, led by "the Master of Hungary", apparently a very old Hungarian monk, who claimed to have been instructed by the Virgin Mary to lead the shepherds of France to the Holy Land to rescue Louis. He led up to 60,000 mostly young peasants to Paris, where he met with Louis IX's mother, the acting regent. The group split up after leaving the city and created disturbances in places such as Rouen, Tours and Orléans. In Amiens, and then in Bourges, they also began to attack Jews. The authorities rounded up and excommunicated the crusaders. However a group led by the Master resisted the authorities outside Bourges, resulting in the Master being killed in the ensuing skirmish.